Bring warmness to your recordings! Warmer is a high quality effect unit which adds warmness to your sound by utilizing spectrum modeling and analog style soft knee compressor. It combines rich, warm analog processing with a straightforward user interface. It is ideal for using on solo instruments and vocal which you need a warmer sound.This makes it an essential tool for mixing and mastering engineers. 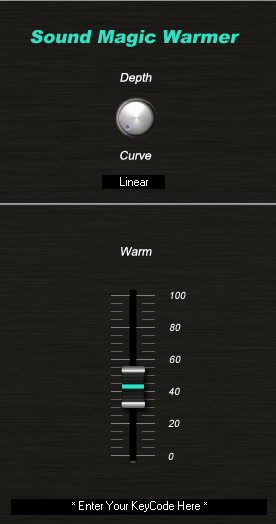 Warmer is provided as a VST effect unit under Microsoft Windows or Add-on for Sound Magic Supreme Piano 2. After receiving payment, we will begin to generate keycode and downloading link for you. This will take some times and you will receive your downloading link and keycode within 48 hours, usually it takes within 12 hours. Downloading link and keycode will send to your payment E-mail address. Please make sure this E-mail address is valid. If you still do not receive any E-mail from us after 48 Hours. Please contact us immediate. simulates speaker feeling on headphone! get a beautiful and natural sounding highs! 3 powerful bass enhancers in 1, .Dominate low frequency! Simulates acclaimed Microphones Sound!